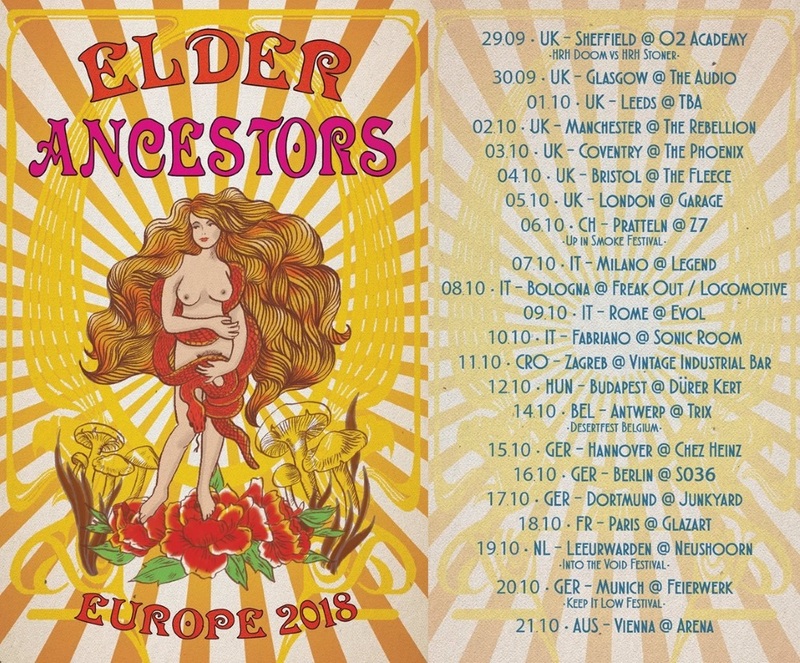 Out of all the many shows and tours playing all over Europe this autumn, Elder and Ancestors at The Garage was one of my most anticipated. I’d seen Rolo Tomassi play that venue earlier in the year, so I knew the PA at the venue was able to produce a monstrous sound. Ancestor‘s new album Suspended In Reflections is a thing of sheer beauty, and Elder‘s live show stunned and amazed me last year. Altogether, this promised to be a magnificent gig. The Garage in Highbury, London lived up to the memory of my last show there. A great beer selection, solid lighting, and an absorbing sound system ticked off all my boxes. Their solid location in the north of the city all made for a great show too. It all kicked off pretty early due to a club night at the show later, with the first of the two bands – Ancestors, taking the stage at 7:30pm. I knew they were going to start with “Gone”, yet nonetheless I wasn’t prepared for what followed. The four-piece band’s sound absorbs you from minute one; a thick, doomy blanket is thrown over you by the instruments, and the surprisingly present synth/keys layer does a wonderful job at encapsulating your focus on the band. The first track from Suspended In Reflections was everything I expected it to be live – emotional, gloomy and powerful. The group vocals worked perfectly live, the harmonious effect created by all three microphones echoing around the room nicely. For those who haven’t caught on – Everything Is Noise,and indeed myself – love Ancestors, especially their latest release. Its beautiful post-rock soundscapes and unmissable songwriting have likely earnt the record its place amongst our album of the year lists. I can without a doubt confirm the band can translate it live, and if anything, make it that little bit heavier – perfect for the environment. Much to my delight, the band played solidly throughout their set, filling in gaps between songs with heavy analogue synths and effects. They transitioned gracefully from songs off Suspended In Reflections into their earlier work, moving from the trippy doomgaze into their earlier stoner rock influences and back again. Finishing with “The Warm Glow”, the band ended on one of their grandest songs in thick layers of synth, brilliant overlapping group vocals, and massive doomy guitars and drums. Hopefully, Ancestors made a name for themselves across the rest of the tour, which traversed Europe until the 21st of October. Seeing a full-hour set would be brilliant, as I couldn’t get enough of their powerful and gripping sound. Check out Suspended In Reflections on their Bandcamp, and have a look at what other tour dates they have lined up on their Facebook page. Having missed Elder at Desertfest in London, and failing to find funds to make the trip to Psycho Las Vegas, I was also hankering to finally catch them. Their set at The Underworld in August 2017 was huge, but the venue left me wanting, as I could barely see (or feel) their set. Needless to say, they did not disappoint, opening their set with an older track, before launching into one of my favourite songs of theirs, “Sanctuary”. Thanks to the quality beer selection at The Garage, I was able to really melt under the barrage of sound Elder laid out on me. The four-piece were unbelievably heavy, but their sound was wonderfully clean at the same time. The two guitars cut through the absorbing bass and thundering drums great, and the vocals fought their corner too. The band smashed through their set, playing songs from Lore, Reflections of a Floating World, Dead Roots Stirring, and even their 2012 two-song single Spires Burn. “Compendium” was incredible live, the climax bringing the house down just like it did at the last show. Suspended In Reflections got the most airtime – “The Falling Veil” and “Thousand Hands” were other takeaways from their show. The sound translates so nicely live; the thick bass perfectly punctuated the fuzzy guitars and groove-laden drums. For those of you who were lucky enough to have seen the last dates on this tour, I hope you enjoyed it as much as I did. For those of you with the chance to catch either of these bands in the future – make sure to! The trippiness of the psych- and post-rock doom these bands play is something to be enjoyed, and both entities can translate their music live with a stoney heaviness that’s more than worth your time. Check out Elder on Facebook too, and dive into their discography on Bandcamp. Next PostToska - "Fire by the Silos"